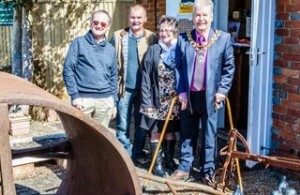 Mayor Councillor Nigel Coltman and other Hailsham town councillors were given a tour of the Hailsham Heritage Centre on Saturday [30 April], which reopens to the public for the 2016 season on Friday 6 May. The heritage museum, which is located in Blackman’s Yard behind the Town Council offices in Market Street and run by local volunteers from the Hailsham Historical Society, houses a small but interesting display including a period kitchen, farming and agriculture, local historical items, 19th and 20th century photographs, wartime artefacts and memorabilia. The museum is open on Fridays and Saturdays from 10am to 12.30pm until Saturday 8th September (admission free) and will feature a host of new exhibtions this year, including a period clothing display and items relating to Hailsham’s Victoria Cross recipient, Nelson Victor Carter VC. For more information visit www.hailshamhistoricalsociety.co.uk.